Samantha Griffin is a Rainbow Hospice home health aide (HHA) who cares for patients in Chicago. 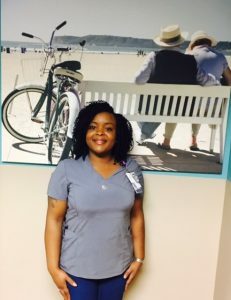 In honor of National Nursing Assistants Week, observed June 14-21, 2018, she gave us a glimpse of a day in her life. A typical day as a hospice home health aide consists of visiting five to six patients per day. Although we provide activities of daily living to our patients, we also offer emotional support for their loved ones. Being an aide also means becoming an advocate for patients and being the “eyes and ears” for nurses—reporting back on how patients are doing on a daily basis. The hardest part about being a hospice HHA is hearing a loved one cry out when someone has transitioned to the end of life. Also, the wear and tear on the body due to the job can be challenging at times. What gets me through these times is remembering that we are all human and that life is unpredictable; we never know what to expect. Families often ask “how do you do this?” I simply say that someone has to! From my 13 years of experience as a hospice health aide I know that no one wants to die alone, and that somebody has to do this job! This is a scary time for patients and their families knowing that they will be absent from the body. The most rewarding part of the job are the intimate moments we as hospice aides share with patients. Often, HHAs are the closest to the patients emotionally, and they will share stories with us that they won’t share with anyone else. That’s what makes the moments special, with great laughs, and knowledge. Even though we take care of them as our patients, it’s usually more of a friendship and sometimes they consider US as family. Furthermore, all patients have an emotional effect on you as a person because after all, we are all human. With each and every experience there is something to learn. It’s rewarding knowing that the work I do makes a difference. Whether we’re there to provide care or even just listen or talk, we all play a major role in providing individualized care for our patients.